A team of Liverpool recruitment consultants have presented Egremont Primary School with a cheque for £250. 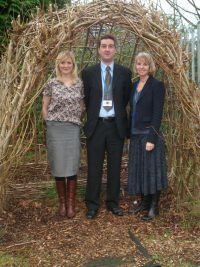 The school is aiming to become a ‘forest school’ after visiting Heswall Community Primary School and seeing excellent pupil engagement. Sue Owen, acting head teacher comments “We recently took 25 of our year four students to visit Heswall. Our pupils were fascinated with the forest classroom project, and we witnessed some real enthusiasm to learn. We would absolutely love to mirror the good work and benchmark our schools progress in the same way”. New Directions Education Ltd is working closely with the Egremont School to help raise funds to realise the ‘forest school’ status. Branch manager Lisa Harper comments “We really want to support the school to achieve this ambition. It has already been acknowledged that the programme works, and New Directions ultimate ambition is to support the education community. We implore the business community; and anyone who can to donate to this excellent cause”. The school has a site to develop the project within their grounds. Recently staff members and parents volunteered time to clear the ground in preparation for the project. Alan Doyle, business manager for the school adds “We are looking for any donations which will directly allow us to implement this project, from soil to secateurs or perhaps a nominal financial contribution”. For more information on how to donate, contact the New Directions team on 0151 515 0820.